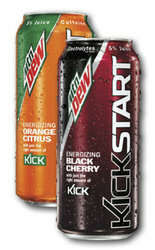 Mountain Dew KickStart. The perfect mix of Mountain Dew and fruit juice, and just the right amount of Kick to get you going. Each 16 oz can has only 80 calories. Enjoy 2 great flavors: Black Cherry and Orange Citrus. Enter Quantity Below. Then Click "Add to Shopping Cart"